Anything worth doing is worth doing as a contest. Running? Sure. Jumping? Certainly. Rolling dice? Well, duh.Throwing typewriters? It’s been done. Digging? I’m not sure if it’s been done before, but now there’s DIG, so you can do it in the comfort of your own home. It should have been obvious that there would be an annual digging contest somewhere in the multiverse. This one is only for the bravest of adventurers. The Hill has treasures aplenty, but it also has monsters, cave-ins, and your competitors. First you stick the pointy bit in the ground, then it gets a bit technical. The Rules. DIG by Mangrove games is a press your luck game, but not a typical one. Many of those games fall into the ultralight category: You roll dice and draw cards until you either wisely stop or things blow up in your face. DIG has that, too. But in DIG that’s not the only thing that happens. Let’s start at the beginning, though. On your way to become the King of the Hill you start with no cards, no galleries and only one Recruit to do the actual digging for you. You don’t actually use a shovel yourself. Your role is more managerial. On your first turn, your only option is to draw a card. But hey, good news, nothing can go wrong yet! If you draw a monster or one of the dreaded collapses you may simply discard it. If you draw an equipment card you take it to your hand. So far, so boring. Fortunately, most of the cards are Precious Stones, and with those you have a decision to make. You can take them to your hand as well to immediately use as currency, or you can start your first gallery by putting the card on the table and placing your Recruit on it. Congratulations, you are now in the mining business? Why would you do that, though? If you can just take the cards to your hand and use them as currency, what’s the point of digging? Well, for one, digging is quicker. When you place a Recruit in a gallery you immediately draw another card and add it to that gallery. More important: it’s the only way to win. You win the game by collecting 10 or more Gems, and those appear every five cards below a recruit in your galleries. A good enough reason to dig? Once you have started digging a gallery things change a little. Now you have to decide before you draw cards if you want to dig in your galleries or besides them. Digging besides them works the same as before. You can even start another gallery if you have another Recruit lazing about. Things heat up when you dig in your existing galleries. You draw a card for every one of your open galleries then and add them below the cards that are already there. You obviously hope for Precious Stones, because a) they’re precious and b) they don’t bite. Maybe you also hope for equipment. Or maybe you don’t. The rulebook is clear that you can only start a gallery with a Precious Stone card, but we couldn’t find out if an equipment card can be added to an open gallery or not. You certainly don’t hope for a monster. None of them are nice, but if you get one of them you hope it’s a Spider that steals your most recently found Gem. (I don’t know why they do that, either.) Or maybe a Ghost that removes the bottom card from its gallery. What you really don’t want is a Werewolf that scares all your Recruits so badly that they run away to the tavern to get drunk – you’ll have to hire new ones. And for lack of Recruits you’ll have to close all your galleries, too. And what you really, really don’t want is an orc that eats one of your Recruits. You can’t even hire that one back, it’s out of the game. As a mine manager telling your people what to dig up is not all you do. You also go to the Tavern! Here is where you hire new Recruits and Companions. Both are paid with Precious Stone cards, but in different ways. For Recruits you pay with the little green crystals shown on every Precious Stone card. Five of them get you a Recruit, and you already know what those are good for. What about companions? Those guys have more specific uses and a more specific price. Each of them wants a specific combination of Precious Stones to enter your service. They are useful to have around because they all have a powerful special ability. The Ninja Cat, for example, protects you from the Werewolf. Not only can you ignore the Werewolf’s effect, you also receive a bounty of two gems for catching one. The Pirate makes each chest, one type of equipment card you can find, twice as valuable. And so on. Finally, next to mining and visiting the tavern, there is a third action you’ll have to take if you want to win the game. All the cards and gems in a gallery are in constant peril of being lost until you close the gallery. 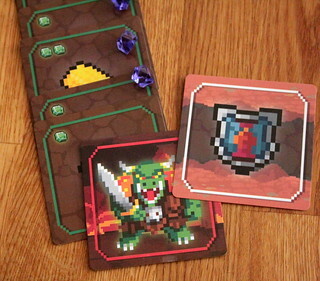 Then you collect the cards to your hand, the gems to your supply, and only then are they safe from monsters and mine collapses. If this brings your supply to ten gems the other players finish the current round and the player with the most gems wins. DIG is a press your luck game, so if you’re one of those people with no luck at all in games you’re at a disadvantage. But unlike many such games, you don’t automatically lose. There are strategic options for you to explore. An obvious one is which companions you hire. 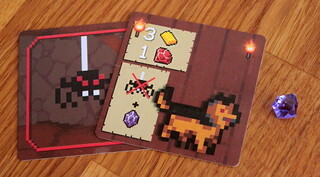 There are four Skeleton cards in the game, so a Knight is more likely to be useful than the Ninja Cat that holds off the one and only Werewolf. But that doggy dude is much more dangerous if he shows up. You also have to decide when to use your equipment cards for best effect. The most important decision is how many galleries you will open. With only one gallery with multiple recruits you find the gems faster. But if that gallery collapses all is lost. Spreading your recruits across four galleries contains the disasters more, but takes longer. And of course there’s the most important decision of them all: when do you close a gallery? Just digging a little deeper in that gallery with four Recruits is a huge risk, sure, but when you go down far enough every card gets a Gem! Those may not be deep decisions compared to your favorite all-nighter strategy game, but they work great in a press-your-luck game. They make it go from “Great, I rolled badly” to “Damn, I should have done that differently.” At least for me, that’s a huge difference. Not everything is golden in the land of DIG, however. Specifically, the rulebook does leave some questions open to interpretation and house-ruling. For instance, can an equipment card go to your gallery to be picked up later when you close the gallery? And if so, does the sentence “you can choose to use the card right away” still apply? And perhaps the biggest open question: what happens when you lose the last recruit in a gallery but the effect doesn’t specifically tell you to close the gallery as well? I hope those details get fixed in the second edition that is currently kickstarting. Despite those problems, DIG is a fun game. It is still a lighter game than what we mostly play, but it’s a heavier game than most press-your-luck games. Just the right level for some fun. And as an old video game nerd I adore the pixellated 8-bit art as well.